I caught a mid morning train out of Den Haag to Utrecht. There I transferred to a train to Dusseldorf. The train scenery through the Netherlands is very flat. As soon as the train crosses the border, German train officials sweep the cars looking at passports and asking questions. You never saw any of this in Belgium or the Netherlands. When the train arrived in Dusseldorf I thought I had just entered the twilight zone. It seemed like everything was very strict (stiff, stuffy?). For the first time, I experienced the Language Barrier. And I saw huge German men walking 4 abreast in the train station. It seemed like if you didn't get out of their way, they'd mow you down. That's probably an overstatement, but its how I felt at the time. Once again, I was completely lost! 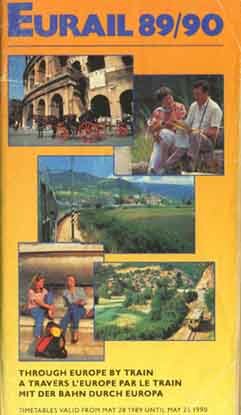 Luckily, I had the "Lets Go Europe" Book and on-the-spot I decided to go to the Youth Hostel. I got on the #835 Bus and asked the Driver if he went to the Jugendherberge. He looked at me and didn't know what I was talking about. I must have pronounced the word wrong. I repeated it a couple of times and he said "no". Then I showed him the "Lets Go" Book and he let out a big smile and said "Oh! Jugendhergerge, Jugendherberge, Ya, Ya, and he waved me in with a big smile". It seemed like a very long bus ride through the downtown area. Then the bus goes over a long bridge (The Rhein River). At the other side, the bus stops. The bus driver waves to me with a smile and yells "Jugendherberge, Jugenderberge". I said "Danke Shaun, Danke Shaun" . I shook the driver's hand and got off the bus. He smiled and pointed across the street at the Youth Hostel. The Dusseldorf Jugendherberge was the first Youth Hostel I'd ever been to. 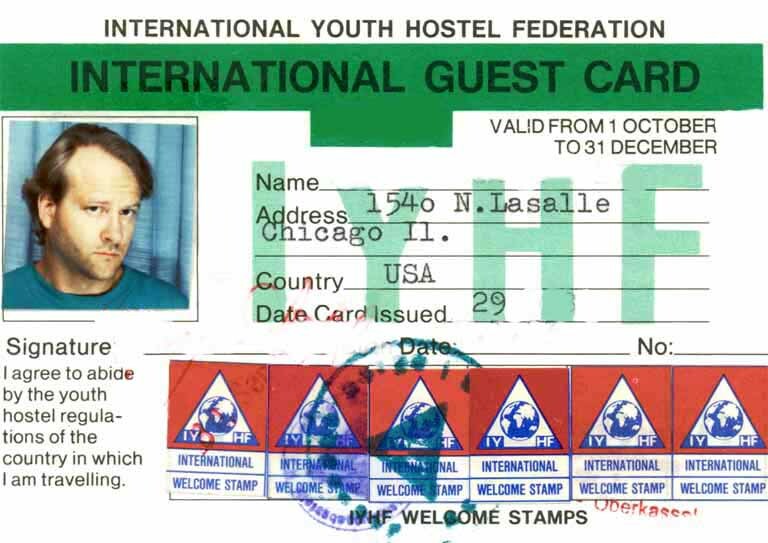 Until now, I'd been apprehensive about going to hostels, because I was afraid of having my stuff ripped off. That proved to be a hollow fear since I've never had anything taken from me at a youth hostel. Youth Hostels are bunk houses for budget travelers. Some have single and double rooms, but the majority are bunk bed dormitories. You share toilets, showers, and kitchen facilities. The quality I've stayed in have ranged from outstanding to bearable. Most hostels include breakfast. Others have full service cafeterias. Some hostels have lockers, most don't. You leave your pack on your bed. What a hostel lacks in comfort, it makes up for in your ability to network with other travelers and tap into their wealth of travel experience and information. After checking into the hostel I met 2 Canadians. Heather from Nova Scotia and Gordon from Ontario. Gordon had just met Heather and had talked her into going to Berlin with him. I told them I was headed to Munich for Oktoberfest. Gordon said "Oh No. You ought to come to Berlin with us". I said Berlin? Gordon said yes! I opened up "Lets Go" to see where Berlin was. I thought it was on the border of East and West Germany, but it was right in the middle of East Germany. I said "Are you kidding? I'm not going into the Iron Curtain. They'll never hear from us again". Gordon assured me everything was ok. He said you take a train from Hamburg to West Berlin through a safe corridor. Its not on the Eurail Pass, but you can buy a ticket and a transit visa on the train when you get into East Germany. I opened up "Lets Go" and read about Berlin. It said no German City has a higher metabolism than Berlin. It seemed like too good of an opportunity to pass up so I said "OK. I'll go to Berlin with you". We agreed to catch the 4-1/2 hour train to Hamburg the next day. 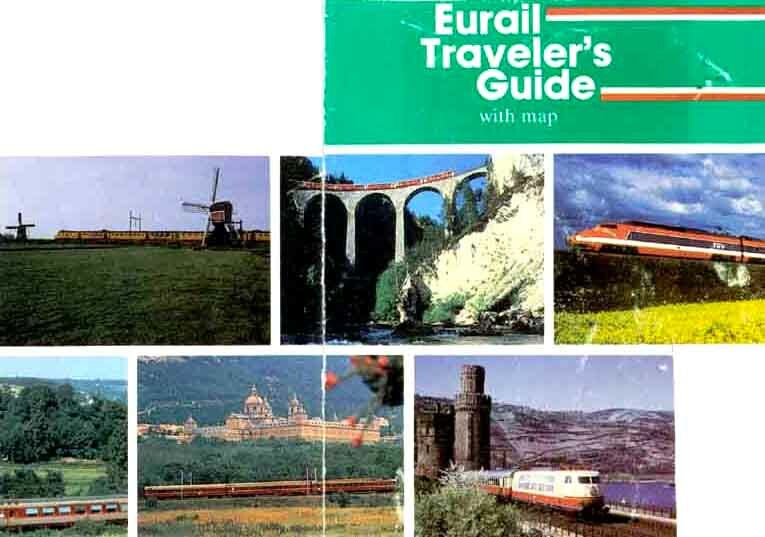 We all had Eurail Passes. 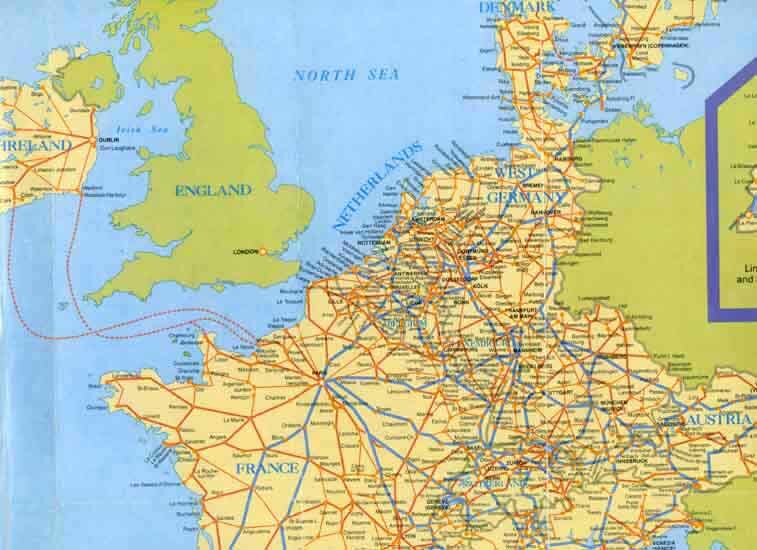 If you're traveling by train, the Eurail Pass is by far the most convenient way to go. Its available to anyone who is not European. You ride in first class compartments, which are nicer and less crowded than second class. And you just show up without a reservation and hop on a train. A few Rail Segments require you to have advance reservations. When you buy the Pass you receive a European Train Timetable. Usually its accurate, but it helps to verify train schedules in advance before traveling. All train stations have up-to-date train schedules posted inside. The train scenery from Dusseldorf to Hamburg was flat with trees and fields. We arrived at 2:06pm and took a subway to the Youth Hostel. I thought the Hamburg hostel was very nice with small bunk rooms and locked lockers. That night we took a walking tour. 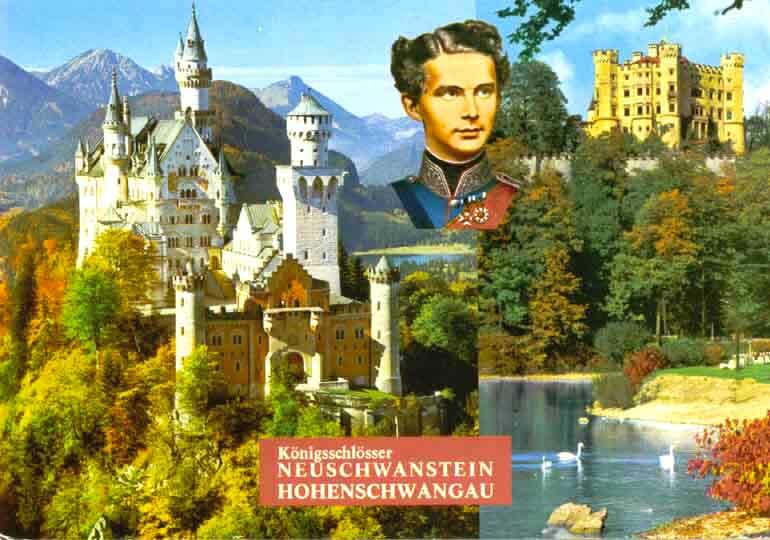 Tomorrow I'm off to Munich. Its a 12 hour train ride from Berlin. Note: This is how long it took when Germany was divided and the railroad tracks in East Germany allowed trains to go no faster than 40 miles an hour. I shared a compartment with a charming English couple. We arrived at Hauptbahnhof (Central Station) at night. Luckily the Tourist Office was open and I booked a single in AM Karstor Hotel, a 10 minute walk to/in Karlsplatz. Whenever I stayed in pensions or budget hotels, I'd usually stay in rooms without toilettes or showers. These rooms are cheaper, they have sinks in the rooms, and the facilities are right down the hall. The next day I took a walking tour. Marienplatz is the city's main square. Lots of neat buildings. The Altes Rathaus has a really neat toy museum. The Neuse Rathaus has its famous Glockenspiel - a mechanized show of dancing figures and jousting knights. There's a huge open market where you can buy fresh foods, clothes, and tons of other goods. And there are huge beer halls that serve cheap meals, very large beers, and have lively bavarian bands that you won't want to miss. The following day I took the Royal Castle Tour. 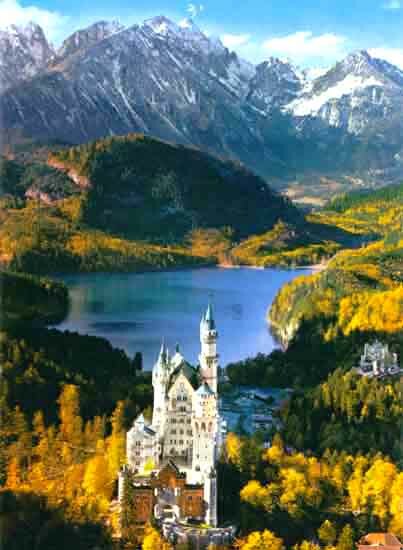 An all day bus tour that takes you through spectacular mountain scenery to visit the 2 fairy tale palaces (castles) of King Ludwig of Bavaria. On the tour I met 2 Americans Kevin and Gayle and had dinner with them. After dinner, Kevin asks a cabby to take us to where the action is. We go for a long ride to a huge circus tent. We go inside and its a huge disco with flashing lights, bizarre music, and tons of people. Its an absolute zoo. After about an hour, high wire acrobats perform a trapize show without a safety net. Its just spectacular! They call this place Die Macht Der Nacht (The Power of the Night). Everybody is dancing together and its a complete riot!!! Munich is a must see for any traveler coming to Germany. The Bavarians know how to have a good time and they'll invite you to the party.